A couple of nice ones from Eddie’s trip this week! 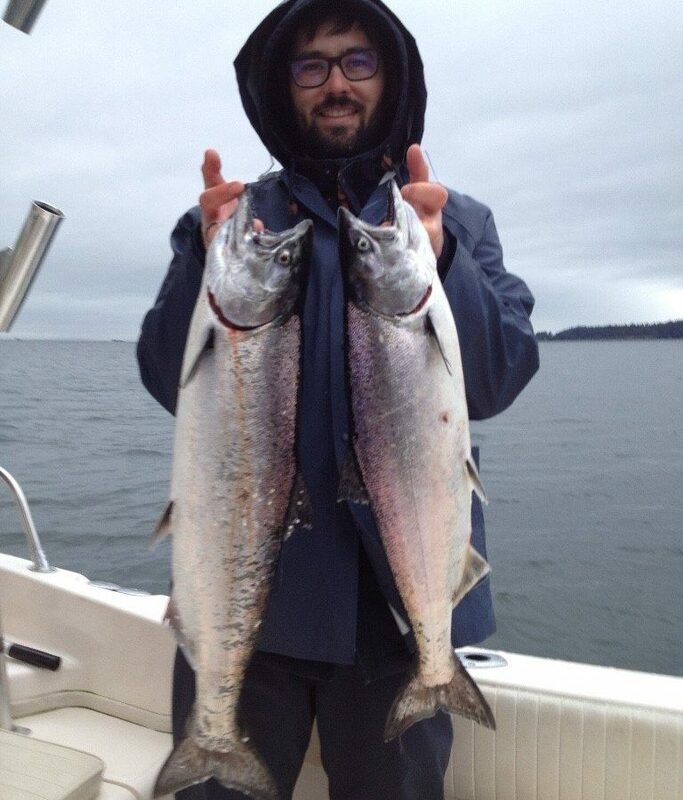 When it comes to winter chinook fishing, you have to go when you can go, despite the winds and the rain. Our boats are equipped with non-slip deck boots and full sets of rain gear so you will stay dry during the trip. We also have heaters on board to take the edge off the coldest and wettest of days. If you wait for a day when the wind forecast is for light variable and it is nice and sunny, well lets just say you might be waiting awhile. It will also be crowded. These kinds of days are usually extremely busy and that can make for slower fishing at times. So put on the winter clothes and get out there to enjoy what has been an excellent season so far. As far as tackle, not much has changed. Eddie reports he has been doing well on a variety of glow flashers and his top spoon has been a 3.0 or 3.5 Irish Cream. Keep your gear close to the bottom, cover ground, look for the bait, and stay in that area and you should do well. Speaking of raingear. I have to put mine on now and head down to the dock this morning to do some maintenance on the boats.